George Bernard Dantzig (/ˈdæntsɪɡ/; November 8, 1914 – May 13, 2005) was an American mathematical scientist who made contributions to industrial engineering, operations research, computer science, economics, and statistics. Dantzig is known for his development of the simplex algorithm, an algorithm for solving linear programming problems, and for his other work with linear programming. In statistics, Dantzig solved two open problems in statistical theory, which he had mistaken for homework after arriving late to a lecture by Jerzy Neyman. Dantzig was the Professor Emeritus of Transportation Sciences and Professor of Operations Research and of Computer Science at Stanford. Born in Portland, Oregon, George Bernard Dantzig was named after George Bernard Shaw, the Irish writer. His father, Tobias Dantzig, was a mathematician and linguist, and his mother, Anja Dantzig (née Ourisson), was a linguist of French Jewish origin. Dantzig's parents met during their study at the University of Paris, where Tobias studied mathematics under Henri Poincaré, after whom Dantzig's brother was named. The Dantzigs immigrated to the United States, where they settled in Portland, Oregon. Early in the 1920s the Dantzig family moved from Baltimore to Washington. His mother became a linguist at the Library of Congress, and his father became a math tutor at the University of Maryland, College Park. Dantzig attended Powell Junior High School and Central High School; one of his friends there was Abraham Seidenberg, who also became a professional mathematician. By the time he reached high school he was already fascinated by geometry, and this interest was further nurtured by his father, challenging him with complicated problems, particularly in projective geometry. 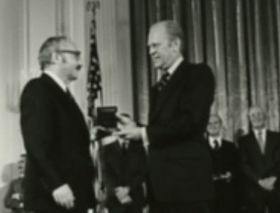 George Dantzig received his B.S. from University of Maryland in 1936 in mathematics and physics, which is part of the University of Maryland College of Computer, Mathematical, and Natural Sciences. He earned his master's degree in mathematics from the University of Michigan in 1938. After a two-year period at the Bureau of Labor Statistics, he enrolled in the doctoral program in mathematics at the University of California, Berkeley, where he studied statistics under Jerzy Neyman. With the outbreak of World War II, Dantzig took a leave of absence from the doctoral program at Berkeley to join the U.S. Air Force Office of Statistical Control. In 1946, he returned to Berkeley to complete the requirements of his program and received his Ph.D. that year. Although he had a faculty offer from Berkeley, he returned to the Air Force as mathematical advisor to the comptroller. He was a member of the National Academy of Sciences, the National Academy of Engineering, and the American Academy of Arts and Sciences. Dantzig was the recipient of many honors, including the first John von Neumann Theory Prize in 1974, the National Medal of Science in 1975, an honorary doctorate from the University of Maryland, College Park in 1976. The Mathematical Programming Society honored Dantzig by creating the George B. Dantzig Prize, bestowed every three years since 1982 on one or two people who have made a significant impact in the field of mathematical programming. Freund wrote further that "through his research in mathematical theory, computation, economic analysis, and applications to industrial problems, Dantzig contributed more than any other researcher to the remarkable development of linear programming". Dantzig's work allows the airline industry, for example, to schedule crews and make fleet assignments. Based on his work tools are developed "that shipping companies use to determine how many planes they need and where their delivery trucks should be deployed. The oil industry long has used linear programming in refinery planning, as it determines how much of its raw product should become different grades of gasoline and how much should be used for petroleum-based byproducts. It is used in manufacturing, revenue management, telecommunications, advertising, architecture, circuit design and countless other areas". An event in Dantzig's life became the origin of a famous story in 1939, while he was a graduate student at UC Berkeley. Near the beginning of a class for which Dantzig was late, professor Jerzy Neyman wrote two examples of famously unsolved statistics problems on the blackboard. When Dantzig arrived, he assumed that the two problems were a homework assignment and wrote them down. According to Dantzig, the problems "seemed to be a little harder than usual", but a few days later he handed in completed solutions for the two problems, still believing that they were an assignment that was overdue. Years later another researcher, Abraham Wald, was preparing to publish an article that arrived at a conclusion for the second problem, and included Dantzig as its co-author when he learned of the earlier solution. This story began to spread and was used as a motivational lesson demonstrating the power of positive thinking. Over time Dantzig's name was removed, and facts were altered, but the basic story persisted in the form of an urban legend and as an introductory scene in the movie Good Will Hunting. Linear programming is a mathematical method for determining a way to achieve the best outcome (such as maximum profit or lowest cost) in a given mathematical model for some list of requirements represented as linear relationships. Linear programming arose as a mathematical model developed during World War II to plan expenditures and returns in order to reduce costs to the army and increase losses to the enemy. It was kept secret until 1947. Postwar, many industries found its use in their daily planning. The founders of this subject are Leonid Kantorovich, a Russian mathematician who developed linear programming problems in 1939, Dantzig, who published the simplex method in 1947, and John von Neumann, who developed the theory of the duality in the same year. Dantzig's original example of finding the best assignment of 70 people to 70 jobs exemplifies the usefulness of linear programming. The computing power required to test all the permutations to select the best assignment is vast; the number of possible configurations exceeds the number of particles in the universe. However, it takes only a moment to find the optimum solution by posing the problem as a linear program and applying the Simplex algorithm. The theory behind linear programming drastically reduces the number of possible optimal solutions that must be checked. In 1963, Dantzig's Linear Programming and Extensions was published by Princeton University Press. Rich in insight and coverage of significant topics, the book quickly became "the bible" of linear programming. Dantzig, George B. (1960), "General convex objective forms", in Arrow, Kenneth J.; Karlin, Samuel; Suppes, Patrick, Mathematical models in the social sciences, 1959: Proceedings of the first Stanford symposium, Stanford mathematical studies in the social sciences, IV, Stanford, California: Stanford University Press, pp. 151–158, ISBN 9780804700214. Dantzig, George B. (June 1940). "On the Non-Existence of Tests of 'Student's' Hypothesis Having Power Functions Independent of σ". The Annals of Mathematical Statistics. 11 (2): 186–92. doi:10.1214/aoms/1177731912. JSTOR 2235875. Wood, Marshall K.; Dantzig, George B. (1949). "Programming of Interdependent Activities: I General Discussion". Econometrica. 17 (3/4): 193–9. doi:10.2307/1905522. JSTOR 1905522. Dantzig, George B. (1949). "Programming of Interdependent Activities: II Mathematical Model". Econometrica. 17 (3): 200–211. doi:10.2307/1905523. JSTOR 1905523. Dantzig, George B. (1955). "Optimal Solution of a Dynamic Leontief Model with Substitution". Econometrica. 23 (3): 295–302. doi:10.2307/1910385. JSTOR 1910385. ^ Gass, Saul I. (2011). "George B. Dantzig". Profiles in Operations Research. International Series in Operations Research & Management Science. 147. pp. 217–240. doi:10.1007/978-1-4419-6281-2_13. ISBN 978-1-4419-6280-5. ^ a b c Richard W. Cottle, B. Curtis Eaves and Michael A. Saunders (2006). "Memorial Resolution: George Bernard Dantzig". Stanford Report, June 7, 2006. ^ a b c d e f g h Albers, Donald J.; Alexanderson, Gerald L.; Reid, Constance, eds. (1990). "George B. Dantzig". More Mathematical People. Harcourt Brace Jovanovich. pp. 60–79. ISBN 978-0-15-158175-7. ^ Robert Freund (1994). "Professor George Dantzig: Linear Programming Founder Turns 80". In: SIAM News, November 1994. ^ a b "The Unsolvable Math Problem". Snopes. June 28, 2011. ^ Dantzig, George (1940). "On the non-existence of tests of "Student's" hypothesis having power functions independent of σ". The Annals of Mathematical Statistics. 11 (2): 186–192. doi:10.1214/aoms/1177731912. ^ Allende, Sira M.; Bouza, Carlos N. (2005). "Professor George Bernard Dantzig, Life & Legend" (PDF). Revista Investigación Operacional. 26 (3): 205–11. ^ Dantzig, George; Wald, Abraham (1951). "On the Fundamental Lemma of Neyman and Pearson". The Annals of Mathematical Statistics. 22: 87–93. doi:10.1214/aoms/1177729695. Retrieved 14 October 2014. ^ Todd, Michael J. (2011). "Review: The Basic George B. Dantzig, by Richard W. Cottle". Bull. Amer. Math. Soc. (N.S.). 48 (1): 123–129. doi:10.1090/S0273-0979-2010-01303-3. Cottle, Richard; Johnson, Ellis; Wets, Roger (March 2007). "George B. Dantzig (1914–2005)" (PDF). Notices of the American Mathematical Society. 54 (3): 344–62. O'Connor, John J.; Robertson, Edmund F., "George Dantzig", MacTutor History of Mathematics archive, University of St Andrews . Dantzig, George B. (1990). "The Diet Problem". Interfaces. 20 (4): 43–7. doi:10.1287/inte.20.4.43. JSTOR 25061369. Cottle, Richard W. (2005). "George B. Dantzig: a legendary life in mathematical programming". Mathematical Programming. 105 (1): 1–8. doi:10.1007/s10107-005-0674-4. ISSN 0025-5610.